In the middle of the feast, O Savior, / fill my thirsting soul with the waters of piety as Thou didst cry to all: / “If anyone thirst, let him come to Me and drink!”// O Christ God, Fountain of our life, glory to Thee! 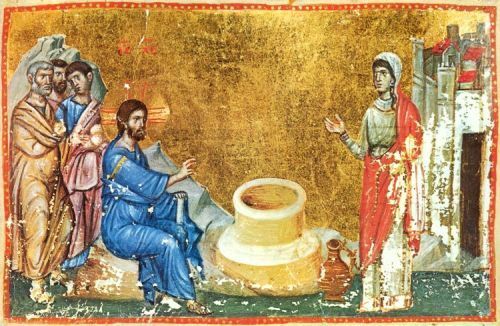 The Samaritan Woman came to the well in faith; / she saw Thee, the Water of wisdom and drank abundantly.// She inherited the Kingdom on high, and is ever glorified! Next Sunday (June 9), there will be a Panikhida following the fellowship meal, requested by the Krupnaks. How does One Live a Holy Orthodox Life amidst Worldliness? In our Orthodox Tradition it is known that sin is not something moralistic, it is ontological, namely, the course from life “according to nature” to life “contrary to nature”. Thus, repentance is man’s return from life contrary to nature to life according to nature. With sin, man lost his communion with God, with his brother and with the creation. With repentance he acquires this communion once again. So, repentance is associated with a progression in man’s liberation from everything enslaving him. The Fathers described this progression in three words: purification, illumination, deification, and this is what is called therapy. This happens throughout life. Therefore, salvation is related to therapy. The physician of the body examines us, makes a diagnosis and recommends an appropriate therapeutic method which we should apply. The same holds true for the illness of the soul. A confession at the time of death opens for man the way to salvation. If he did not have time to be cured spiritually, then the Church with its prayers helps man to salvation, bearing in mind that perfection is endless, it is a dynamic not a static state. Throughout our life we must have this “spirit of repentance”. We should consider how we were created by God and the point we have reached because of sin. If we read carefully the book of Genesis, according to the teachings of the Fathers of the Church, and see how Adam and Eve lived and what they became afterwards because of sin, then repentance will develop inside us. So, someone who has the “spirit” of repentance throughout his life feels this repentance at the hour of death, and actually he feels it to a great degree. On the contrary, when he lives his life without repentance it is difficult to show repentance at the last moment. My Elder, of everlasting memory, the Metropolitan of Edessa Kallinikos, lived continuously with the memory of death. When he was told by the doctors that he had a tumor in the brain, he confessed right away, he wrote his will, he prayed and had absolute faith in God, saying: “Perhaps God said to me ‘stop’. I don’t need you any more”. He would pray continuously saying “Thy will be done”. He gave himself up to God and had a peaceful and saintly end, similar to his whole life.